By fall, visitors to Evergreen Brickworks in Toronto will use digital displays to find their way around and learn about what they’re looking at. The reconstructed brick factory will have about 30 of the displays, six of which will be touch screens so people can request information, says Fraser Los, Evergreen’s communications manager. At the West Edmonton Mall, smartphone users can see plans of the mall’s interior in Google Maps. Their phones can tell them where they are in the mall, including what floor they’re on, says Aaron Brindle, a Google Canada spokesperson. These are examples of digital wayfinding, a group of technologies that help people find their way around indoors. One approach, sometimes called indoor GPS, allows mobile devices to determine where they are inside a building. Victoria-based WiFarer Inc. sells this kind of system. It can locate users and provide turn-by-turn directions on Android and Apple smartphones, taking into account special needs like wheelchair accessibility. Location-specific content – such as descriptions of exhibits in a museum – can be embedded. The Royal British Columbia Museum in Victoria uses WiFarer to guide visitors and offer text, audio and video information about exhibits. The Vancouver International Airport and University of British Columbia are also implementing it. WiFarer uses a mixture of data to determine a device’s location, explains Philip Stanger, the company’s chief executive. WiFi signals play a big role. Because signals bounce and echo inside a building, he says, it’s not quite as simple as classic triangulation where distance to three base stations can pinpoint the device’s location – indoor navigation relies on a “fingerprint” of signal patterns. Brindle says the way Google locates devices inside a building is similar. The West Edmonton Mall is the only Canadian site with Google Indoor Maps, but there are many sites in the U.S., Europe, Japan and Australia. Evergreen Brickworks’ system involves interactive displays. These go beyond static signs in several ways, says Chris Wiegand, chief executive of Toronto-based Jibestream Interactive Media Inc. , which sells the system. 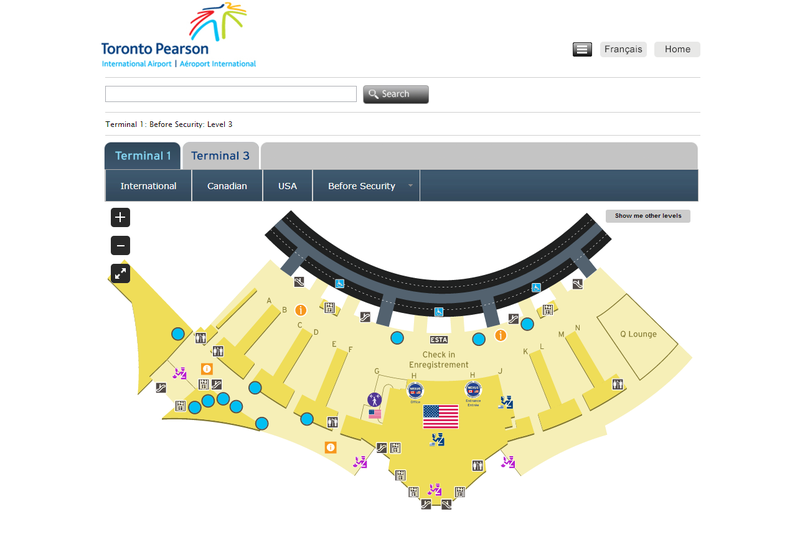 Toronto’s Pearson International Airport also uses Jibestream. At Jibestream’s displays, visitors can request directions to a destination and be shown turn-by-turn instructions. The system can also provide special instructions for wheelchairs, Wiegand adds. And it can handle short-term changes such as an escalator being out of order or a corridor closed. For large venues where things change constantly – such as hospitals –quick updates are a major advantage, Wiegand says. Customers like not getting lost. There can be more tangible benefits too. Stanger says one U.S. study found that in a 500- to 600-room hospital, health professionals spending time giving directions costs $220,000 a year in lost productivity. Advertising is another way these systems can pay for themselves – and when a viewer’s destination is known, it can be specific to where the person is going. Once customers sign up for indoor navigation, retailers can benefit from knowing more about their movements, says Duncan Stewart, director of research for technology, media and telecommunications at consulting firm Deloitte in Toronto. Aggregate data on which displays people stop at is useful, he says, as is knowing right away when people are waiting in long lineups. But the real payoff could be in combating “showrooming” – the word that worried retailers have for some customers’ habit of checking competitors’ prices for merchandise they’re looking at in a bricks-and-mortar store. Stewart predicts retailers could start offering on-the-spot discounts when they detect customers doing this, though he admits there could be privacy concerns.